Summary: What are the fault and its solution of cone crusher? During cone crusher working process, cone crusher will appear more or less problems, many customers don't know how to solve it. In this text, we will talk about the fault and solution of cone crusher. What are the fault and its solution of cone crusher? During cone crusher working process, cone crusher will appear more or less problems, many customers don't know how to solve it. In this text, we will talk about the fault and solution of cone crusher. No oil flow within the flow indicator. The oil pump runs but the oil pressure below 0.05Mpa. In this case, the operator should check the oil temperature, check whether the oil switch is open or not. The oil pressure in the oil pipe before and after the filter is different. The operator should clean the filter. When the oil pressure exceeds 0.04Mpa, the filter must be cleaned. First, do not let the oil pass through the filter, and then remove it. Supply the oil directly to the crusher for less than 2 - 3 hours. If the oil pipe or the inner oil circuit is blocked, should stop the crusher, and find the block point and remove. The oil back flow capacity in the tank decreases with the oil level apparently low down. 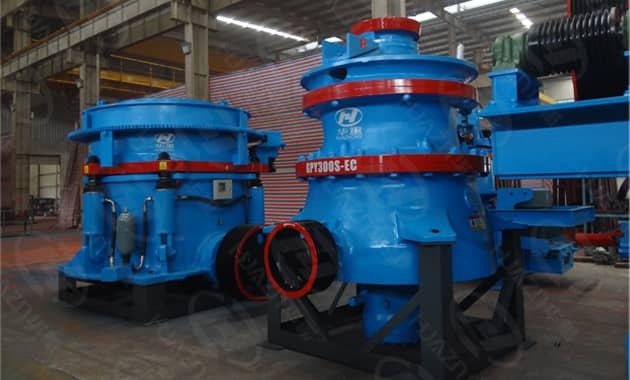 This may be caused by the oil leakage from the crusher bottom cap, from the driving shaft cover and flange wheel, or the return oil ring groove of the spherical bearing seat is blocked, or the oil is given too much, and the oil is lost from the dust proof device.